If someone tried to tell girls that they do not belong in the computing industry, they would be rightfully offended. However, according to the American Association of University Women (AAUW), women only make up 12 percent of engineers and the number of women in computing is steadily dropping. The U.S. Department of Labor estimates that the number of computer and information technology jobs is projected to grow 12 percent by 2024, yet at current rates, all students graduating in the U.S. with a bachelor’s degree in computer science will only be able to fill 30 percent of those jobs. You can imagine these kinds of predictions get the attention of technology companies like Dell. Dell believes boosting the number of women who enter STEM fields—in science, technology, engineering and math—is critical to expanding the nation’s hiring pool, as well as helping to create more equity in gender pay and bringing new perspective to issues the world faces. For a number of reasons, too many young women shy away from science and tech starting in high school. Many students lack a good pathway into STEM-related industries. STEM educators are struggling with poor training and curriculum. Girls are aware that the tech world is dominated by men—and unfortunately, we’re seeing that even if they study computer science and engineering in college, they opt out professionally. Meanwhile, that whole digital age we’ve been talking about? It’s here. It’s now. Dell’s Future Ready campaign shows what our world can do with the smarter use of data, the value of the cloud, and the power of Dell’s network. We’ve been asking our customers: "Is your business future ready?" Dell is also asking, in this increasingly tech-focused marketplace, are our kids future ready? And more specifically, how can we support women and youth in STEM careers, where they have traditionally been under-represented? At Dell, we focus on underserved youth because we need everyone participating in STEM. Not just to meet the demand, but to help us innovate and create a workforce of the future. I recently had the opportunity to spend time with girls interested in STEM and talk about their futures, in my role as Dell’s Director of Global Giving. Girls Who Code (GWC) runs a 7-week summer immersion program for junior and senior girls to learn coding, gain self-esteem and obtain exposure to tech jobs. 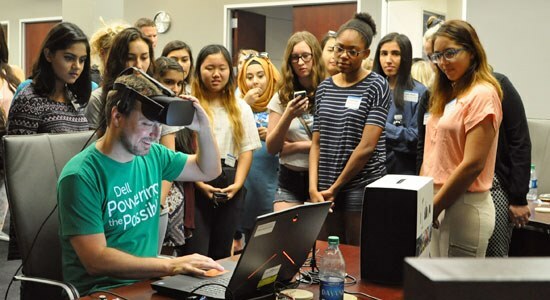 During their field trip to Dell, these girls packed a lot into one day, including attending an Alienware workshop designed to complement their GWC curriculum and mentoring by various female leaders at Dell. Read more about the GWC’s time at Dell. The girls each expressed how good it feels to be accepted for their passion in STEM subjects and activities like coding and programming. They talked about how they’ve often felt self-conscious about being the so-called nerdy girl—but how GWC and the support of their parents, peers and teachers have helped them to feel confident about their interests and talents. Dell is a company that believes in matching passion with capabilities through the power of technology—and we figure out innovative ways to bring technology to people through our Global Giving initiatives. Before leading the Giving team, I was focused on growing Dell’s global Cloud Services business. This work involved a lot of complex problem-solving. I learned to be comfortable with jumping into an issue and wrestling my way to a solution. Today, in my role with Dell Global Giving, I am still problem-solving. Along with our Youth Learning programs and our team members’ expertise, we’re figuring out the best ways to apply Dell’s technology to make a real, positive impact on kids who otherwise would not be very prepared for our 21st century, digital world. The good news is a growing number of youth organizations are working hard to spark a passion for STEM and digital literacy. And the tech industry is listening and investing to understand how we can increase interest in what we think is a pretty awesome field. Dell is strengthening its focus on girls and STEM by working with existing and new Youth Learning partners who share our goal. Partners like GWC, Girlstart and others are critical to this journey. Through different educational programs, we use innovative methods to bring STEM education to underserved kids who are struggling to find it now. It’s inspiring to think about what the GWC girls I met will do because they’ve been given a richer access to STEM. And, I’m excited to share in the year ahead how Dell and its Youth Learning partners are connecting youth to STEM education and the many possibilities that STEM fields offer. So, what do your kids need to enable them to better envision their future in STEM? Educators, parents and the community must repeatedly surround girls with opportunities to immerse themselves in STEM learning in their everyday lives. This everyday exposure would not only raise awareness of STEM, but also serve to boost girls’ confidence when stepping outside of their comfort zone. Technology helps open such opportunities, whether it’s through hands-on 3D printing projects, fun apps that teach coding, and even space exploration! Universal access to technology can also help neutralize gender stereotypes by providing girls equal opportunities to build and create. Showing girls real-world examples of how specific STEM careers are helping to solve the world’s problems can change the abstract perception of STEM fields to one that is more tangible. Examples include developing interactive games that help patients suffering from neurological disorders, 3D printing prosthetic hands for children, writing software that helps stroke patients communicate, implementing solar technology to power classrooms, and more. Connecting girls to role models and mentors in STEM fields, particularly women, who share how they work with and help people helps girls further identify opportunities for bridging passion and career. These connections can be made in various ways, as a one-time effort or ongoing project. Schools can engage parents and the community to participate in a STEM night, partner with higher education institutions, or even team elementary school students up with high school students on STEM projects. Community members and companies can help girls learn more about STEM careers by hosting career days or offering summer internships. very nice article !! and great work !